You may be looking for the Friendship command. The Sweet Memories is a Keychain for Sora's Keyblade that appears in Kingdom Hearts II. It is obtained by completing the 100 Acre Wood. The Sweet Memories Keychain is designed around elements of the 100 Acre Wood world. It consists of a honey-covered honey pot handle with a model of a tree trunk as the blade's shaft. The end of the key consists of a branch with a beehive being the teeth, due to Pooh's love for honey. Its Keychain design is a Honey Bee. "Sweet Memories" refer to Pooh regaining his memories of Sora, as well as the use of honey in the Keyblade's design. 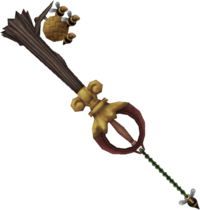 This Keyblade is the weakest of all the Keyblades regarding its stat bonuses; it provides no additional physical or magic power to Sora. Its use instead lies in its ability, Lucky Lucky, which increases the frequency of obtaining synthesis items from defeated enemies. This makes Sweet Memories part of the Lucky Lucky combo, which maximizes the party's chances of acquiring items. Because it is one of the weakest Keyblades in the game, Sweet Memories is used quite effectively with Valor Form, as Sora levels up this form depending on the number of successful hits. Pair it up with Oathkeeper to prolong the effect. In Kingdom Hearts II Final Mix, Sweet Memories' stats are altered; it has +4 magical power, but no physical power. Its passive ability has also been changed to Drive Converter, which turns most of the Munny orbs enemies drop into Drive Orbs when equipped, making it quite handy to use for leveling up Master Form. Combine the effect of Sweet Memories with Drive Converter for better results.